Rev. 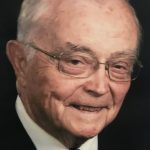 James Wilson Harmon, 95, passed away Friday, April 5, 2019 at his residence. He was born January 11, 1924 in Rutherford County, son of the late Hammie and Emma Parris Harmon. Rev. Harmon was a graduate of Furman University and Southwestern Baptist Theological Seminary. He served his country in the U.S. Coast Guard during WWII as a chaplain on a ship which was part of the decoy fleet during the Normandy Invasion. He also saw action in the Pacific Theater. He served many congregations which include the Minister of Music and Education at Sans Souci Baptist Church in Greenville, SC. ; the Pastor of First Baptist Church, Kirbyville, TX. ; Waco Baptist Church, Waco, NC; Southside Baptist Church, Winston-Salem, NC; and Main Street Baptist Church, Kernersville, NC; the Interim Pastor at Fellowship Baptist Church, Winston-Salem, NC, Oaklawn Baptist Church, Winston-Salem, NC, and Farmington Baptist Church. He enjoyed music, golf, painting, especially pictures for his family. Rev. Harmon was also a gentle and loving man whose main purposes in life were to serve his Lord and to care for others. Survivors include his wife, Dorothy Stone Harmon; his three children, James (Jim) Harmon, Jr. and his wife, Erica, Craig Harmon and his wife, Sonta; Katrina Logeman and her husband, Doug; six grandchildren; Nathaniel Harmon and wife, Kristen, Amelia Harmon, Wesley Harmon, Baylee Harding, Parris Hickman and husband, Andrew, and Brandon Cameron. A funeral service will be held at 2:00 PM Monday, April 8, 2019 at Hayworth-Miller Silas Creek Chapel with Rev. Nathan Parrish officiating. The family will receive friends from 12:30 PM to 2:00 PM Monday April 8, 2019 before the service at the funeral home. Interment will be private. In lieu of flowers memorials may be made to Main Street Baptist Church, 126 N. Main Street, Kernersville, NC 27284; Peace Haven Baptist Church, 3384 York Road, Winston-Salem, NC 27106 or Amedisys Hospice, 2929 Crouse Ln., Ste E., Burlington, NC 27215. Online condolences may be made at www.hayworth-miller.com.